Rajasthan has always been a center of attraction for its culture variation, This is the place where we can find diversity in one place, where people are keen to know about Rajasthan. Rajasthan is city famous for the culture that spread joy and spirit of love, people from all over the world come to be the part of this city and feel the bliss. One of the biggest factors that have changed its significance is Rajasthan Film Festival. This film festival is one of the Best Award function in Rajasthan. It has given new dimensions and upheld the level and provided for the filmmakers, artists, and technicians of Rajasthani cinema. This step has `motivated them and now they work harder and are trying to take Rajasthan Cinema to a new level altogether. From the last 5 years, this film festival is able to sustain and build the trust of people and thus comes up with a new idea and thought process to win the hearts of the audience every year. This film festival is celebrated in various locations. Nowadays people are running towards westernization and forgetting their cultural roots, Comprehending this fact, Sanjana Sharma renowned personality of Rajasthani cinema and the founder of Kanchan Cassettes & Series took a risky task in hand and then initiated Rajasthan Film Festival on 28th September 2013. because of this people are now working for there culture. Rajasthan Film Festival involves events, award show to honor and encourage the artistic and technical excellence of artists in Rajasthani cinema, this provides them recognition amongst common people and a platform where they can come up with their talent. Some attractions of this film festival are are dance performances, plays, live performances by singers, stand up comedians and poets. 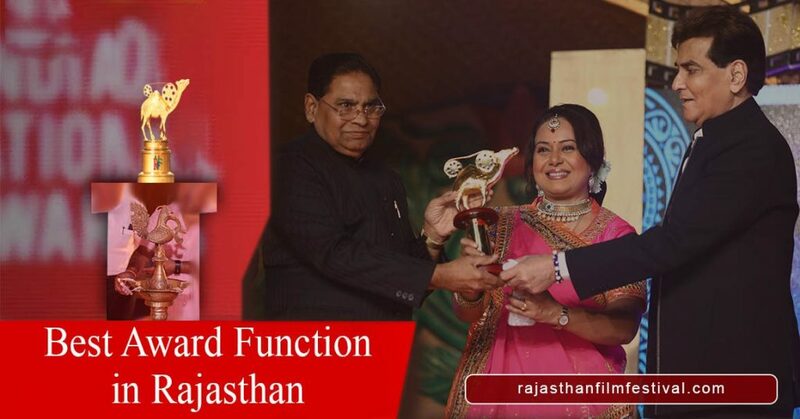 Rajasthan Film Festival is Best award function in Rajasthan that has the vision to stand up the survival of Rajasthani culture and give identification to the artists who come forward and work for regional cinemas. Many famous and renowned personality of Indian cinema come and attend this award function, watching the biggest celebrities builds confidence and motivation to work more and more.